Sleek, airy, spacious. This is the motor yacht Majestic, a brand-new vessel that made its maiden voyage in 2013, amidst the glittering waters of the Galapagos archipelago. 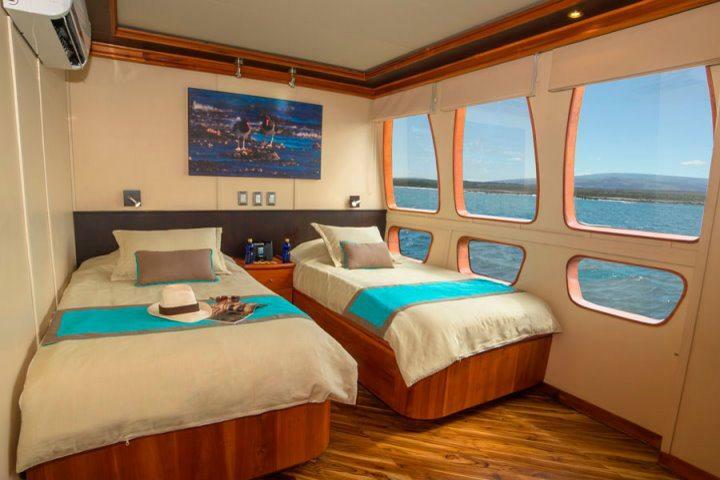 With its unique custom design and luminous picture windows on every level, this 115-foot vessel offers a first-class way of seeing the islands made legendary by Charles Darwin back in 1835. The Majestic instantly dazzles all who board with its sun-filled cabins and spacious deck. It also entices with its comfortable lounge and bar, where passengers can socialize and listen to fascinating talks from the on-board naturalist. But most of all, it provides an intimate, 16-person setting for exploring one of nature’s greatest wonders, a wildlife refuge that is among one of the last truly pristine places on the planet. The Majestic’s nine cabins all come with two twin beds, which can easily be converted into a matrimonial unit. Individual air-conditioning and private baths are also standard, as well as abundant hot water for showering every morning in comfort. Best of all, though, the multiple portals in every room mean you’ll never miss a moment of these enchanted islands, as their unforgettable wildlife slides by just outside your window. The Majestic’s common areas offer the perfect blend of intimacy and spaciousness. Whether you’re taking the evening breezes in the Jacuzzi, or savoring a gourmet meal in the dining room below, you’ll have the pleasure of sharing experiences with your fellow adventurers in living areas that are ablaze with sunlight. At night, cap it all off with drinks in the yacht’s lounge, which doubles as a lecture area for learning about the exotic species you’ll encounter on shore.